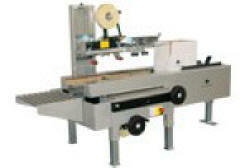 Automatic Case Loading and Taping - Operator folds case open to a rectangle and pushes it onto the dead plate. A pneumatic mechanism automatically folds minor (inner) and major flaps on bottom of case – this means the entire bottom of the case will be closed during loading! After loading the case manually with your products, operator folds the rear minor flap down and pushes the case into the belts. The leading top minor flap and the major top flaps are folded automatically and 2” wide tape is applied on top and bottom, simultaneously. Fast, efficient erecting and loading plus uniform top and bottom case taping of your RSC shipping cartons!